Last week I highlighted an important children’s public health initiative undertaken by the American Academy of Pediatrics (AAP). Another public policy statement for children’s welfare was published in the October edition of the journal “Pediatrics.” “Global Climate Change and Children’s Health” is the AAP’s official position on human influence on our warming planet and its impact on children who, by definition, are our most vulnerable citizens. Now, “climate change” is sometimes characterized as being” controversial” but that term is somewhat misapplied to this subject. It may be “controversial” in a political context as elected officials attempt to address the economic concerns that policy proposals could have on (typically deep pocketed) contributors’ bottom line. But there is no actual scientific controversy but rather a broad based consensus among experts and academics from varied scientific and social fields on the many dangers that this evolving event presents to the world at large and in particular to our children. One can certainly find technical studies in respected, widely read scientific journals with disputes about various aspects of climate change: the depth, breadth, or rate of impact of this phenomon on human habitation and the economic benefits or detriments of doing vs not doing something. But questions of the basic reality of human influenced climate change or that this problem is worsening can not be found in such balanced and nonpartisan sources but rather are placed in lay publications and political forums in our many communications media and their funding sources are increasingly shown to circle back to the various economic players referenced above. At the risk of sounding self serving, let me say that we pediatricians are generally at least a reasonably smart bunch and we aren’t a bunch of doctrinaire, agenda driven crazies. Our concern is our patients–your children–and the fact that our professional consensus is that human influenced climate change is a danger that must be addressed, in my opinion, should be respected given the cautious, informed, and thoughtful source. There is strong technical data to justify our concern. So if that is an “agenda” that drives us in the AAP (proud member since 1988) then I am unabashedly guilty as charged. It is certainly NOT my purpose here to push one’s political choices one way or the other. Vote however you like: republican or democrat, vote your conscience or your pocketbook, for the candidate with the best speaking style or for the one who you think understands you best. But the air we breath, the water we drink, and the soil under our feet must be protected for the health, safety, and well being of our children, grandchildren, and descendents beyond. So, please, when you do vote, make sure that you hold the candidates collective feet to the fire on this essential issue. Thanks for following; please send along questions or comments. The American Academy of Pediatrics (AAP) has just announced an important new public health program, encouraging us pediatricians to take an activist role in identifying and managing children of families struggling with food insecurity, a state of being without reliable access to a sufficient quantity of affordable, nutritious food. Food insecurity is not a trivial issue in our community. Fortunately the numbers have decreased since peaking in 2007. However, still almost 15 million American children are chronically food stressed. Locally, 1/7 Ocean County households are food insecure with family of 4 “Real Cost of Living” income of < $62,936: 64,000 people (25,800 kids, or 19.3%). While average family income has been rising steadily in the past few years, so has poverty; 2000-2010 rates increased from 6.7-11%. In the last year have you worried that your food would run out before you have money for more? Do your groceries purchased always last until you have money to buy more? Making this part of a regular check up can take much of the stigma out of beginning this difficult but important conversation. Here is a list of functioning food pantries in Ocean County. The Jon Bon Jovi Soul Foundation runs its “Soul Kitchen.” The BEAT Center in Silverton Plaza, Toms River, coordinates the efforts of these and related organizations. Almost half of all recipients of Supplemental Nutritional Assistance Programs (SNAP), AKA “food stamps” are children. The financial impact of not addressing the long term effects of poor nutrition on children–in health expenditures, lost tax revenue from citizens unable to complete their education and enter productive careers, and even law enforcment costs when many of these lives degenerate into criminal/antisocial activity–to say nothing of the human costs–is substantial. Do they outweigh the costs of SNAP? Not for me to say here. All I will say is that as a father, a pediatrician, and an American, I cannot stand the thought of any child going to school hungry. I am proud to be a member of the AAP for taking on this serious and necessary challenge to help those youngest and most vulnerable among us. Let’s all try and do our part. Thanks for following. 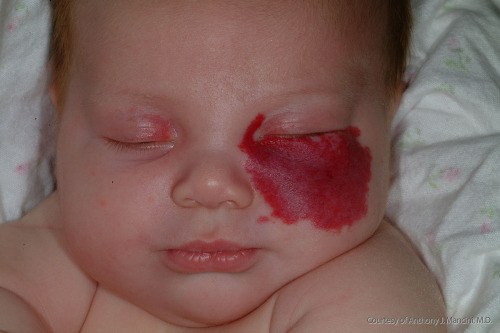 Hemangiomas are more common in females, with family history, in premature infants or pregnancies of older mothers. 80% appear on the upper 1/3 of the body. They are typically not present at birth but rather appear in the first 3 months of life and grow in size over the next 1-18 months (80% have reached maximum size within 3 months). Subsequently they mostly shrink away on their own (“involute”). Central grey/white streaking or stippling is usually evidence that this process has begun. Complete resolution can take as much as 10 years. 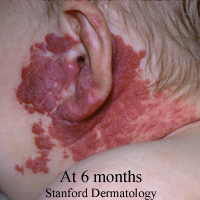 Lesions present at birth are called vascular malformations which are quite different and sometimes (but by no means frequently) associated with more serious problems. In most instances, no treatment is necessary and these marks will ultimately go away completely on their own. Despite their red, red/blue, and “juicey” appearance, when injured they tend to bleed no worse than regular skin. Lesions require treatment if they are very large and particularly if >25% are “ulcerative”(tissue breakdown), block sensory organs or the airway, or persist into school age. Larger lesions may need advanced imaging iike ultrasound or MRI. Nowadays, when treatment is necessary, we use oral or topical propranolol, compression bandages,intra-lesional injections or oral steroids, and occasionaly lasers. There are very unusual syndromes where these lesions are part of a constellation of abnormalities, like the “PHACES” syndrome, “PELVIS” syndrome, and POSSIBLY “Kassebach Merrit syndrome.” In 30 years I have yet to encounter them. I’ll keep looking , and hope I never find any. I hope this is helpful. Thanks for the inquiry. Please send along other questions or comments, and thanks for following. Another installment to reinforce one of the central themes of my approach to caring for your child and to this blog. Treat what needs to be treated–something that has some adverse effect on your child’s well being and will not resolve on its own in some reasonable time frame. Employ only treatments that are demonstrably effective by scientific, statistically accurate studies. I have discussed antibiotics and this principal previously. This link to that posting includes summaries of appropriate antibiotic use which I encourage you to review. Please recall that antibiotics do not specifically treat fever (even higher or more prolonged), “swollen glands,” cough, dark nasal discharge, or red/pus covered throat and tonsils. George Costanza from “Seinfeld” may think “Soda” is a great child’s name. But its not such a great drink for your kids. Personally, I never drink carbonated soft drinks (CSD). The large consensus of data demonstrates a clear link of CSD and obesity. And, I will add, be careful what you read: if that article concludes otherwise, you should consider the source. Note the concentration of sugar in CSD here. We should also keep in mind that the sugars in CSD since 1984 have come from high fructose corn syrup (HFCS). Why? Because its cheaper than sucrose, of course!! The beverage industry has long argued that “sugar is sugar.” However, strong and growing evidence strongly suggests otherwise. We must also keep in mind the caffeine content of CSDs. Given the stresses and challenges to our children’s healthy sleep, I strongly urge parents to avoid all caffeine in children’s diets. Some feel that diet soda and artificial sweeteners are the answer. The FDA does take the position “that aspartame is safe as a general purpose sweetener in food.” And the American Cancer Society has studied the subject carefully and has found no undue risk in their use. But there are persistent and mostly legitimate concerns. I advise against them. By the way, when it comes to sugar, sports drinks (gatorade, powerade, others) aren’t necessarily much better. And even fruit juices can be loaded with calories. The good news is that we as society seem to be getting the message. I encourage my parents to continue along those lines. My advise–some fruit juice with breakfast is fine. The rest of the day eat fruit for that nutrition–the fiber naturally contained with the juice is much healthier. The rest of the day drink water or club soda sweetened with lemon or lime, and low fat or skim milk.